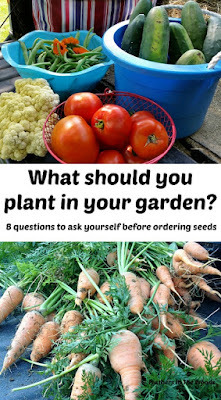 What should you plant in your garden? This is a very exciting time of year for gardeners. The boredom of the winter garden is over, seed catalogs are out and everyone is pouring over the glossy pictures deciding what to plant in their gardens this year. 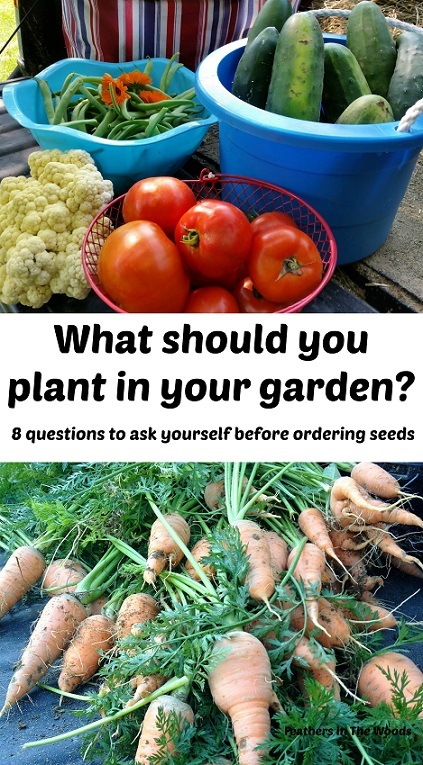 Whether you'll have a small garden with just a few veggies for fresh salads or a garden big enough to preserve food for all winter long, you need to ask yourself a few questions before ordering your seeds. 1) What grows in your gardening zone? No matter how hard I try I will never get avocado trees to grow in my gardening zone and fighting it is pretty much useless. Save yourself the disappointment by finding out your gardening zone and plant accordingly. 2) What do you have the space for? Unless your garden is really huge, you'll have to consider space when deciding what to plant. Some plants take up much more space then others and overcrowded plants rarely produce well. You can find spacing requirements in seed catalogs and plan accordingly. 3) What do you have the time for? Some plants are very low maintenance like raspberry bushes or grapevines. Others are going to require a lot more attention. Decide how much time weekly you can put into gardening. 4) How long is your growing season? Tomatoes are a prime example of a plant you need to choose based on your growing season. Some varieties can be ready in under 50 days while others take over 3 months. Choose based on your growing season unless you plan on extending it with row covers. 5) How much sun does your garden get? Full sun, partial sun or shade? It's important to pick your plants based on the amount of sun the garden gets or they won't thrive. 6) What do you like? What do you buy regularly? You might have heard that one zucchini plant can produce 10 pounds of zucchini, but it won't do you any good to plant a whole row of them if you don't like zucchini very much. 7) What is local or cheap? If you can buy it locally grown and it's cheap you might want to pass on growing it if space is limited. Around here fresh corn is super cheap in summer. I can get it at the farmers market quite easily, plus I never have great luck with it. Same with strawberries. I use my garden space for things I can't get locally & cheap. 8) How much do you need? Do you want to can enough tomatoes for a winter's worth of spaghetti sauce or just have enough for summer salads? Will you be making grape jelly or just snacking on grapes? This answer definitely impacts how many of each plant you'll need! What does your sun map say you have room for? Make and consult your sun map of your garden to determine how much space you have for full sun, partial sun and shade plants. Trust me, if you plan a garden of full sun vegetables and it turns out your garden only gets partial sun you'll be disappointed. What makes you happy? I have a love affair with raw peas. It's quite bizarre, I know. Nobody else here likes peas and I really don't like preparing and cooking them. Nothing makes me happier though, then grabbing a few full pods from the vine and eating those little peas while I'm gardening. So I grow peas every year just so I can snack on them while I'm gardening. Also, growing up my grandfather taught me to garden in his city lot backyard where he grew green onions, cucumbers and tomatoes every year. I grow these every year because they remind me of him and that makes me happy. We also happen to really like those 3 and anything I have left over I give away to neighbors and friends....and that makes me happy too. I guess that's probably the number one reason I garden, because it makes me happy. Why do you garden? Curious about the fabled Summer Of Kohlrabi? Check out this post: 11 gardening mistakes that will cost you $$. The story is right near the top of the article. Enjoy! Perfect timing on this post! We are planning our beds right now and will be constructing them next weekend. Thanks for the great tips on getting me ahead of the curve on what I will plant. Your article made me realize that while I love squash and zucchini they are pretty available and plentiful in my area and my husband wouldn't eat them under any circumstances. Therefore not a good use of my limited space! Awesome, so glad I could help! Luckily my kids love zucchini as much as I do so I get to plant that. They are not fond of the peas and hot peppers though so I only plant enough for me. Good luck with your new garden beds! This is a great idea. I am always struggling to grow things in my garden. Tomatos, lettuce, and beans are all I can grow without fail! Happy Monday from the Thank Goodness it's Monday Linkup. So many choices... we already planted 2 salad garden beds (WAY WAY early!! ). Yes, there are peas and we tend to eat the peas fresh and raw IN the garden.... I understand your love of them... they just taste SO good like that. :) Thank you for the post. I am certainly glad I'm not the only one! lol My son eats cucumbers whole. He just rinses them in the garden hose and eats it like a banana. I can't blame him though, it's just all so good when it's fresh! I hope the frost stays away from your salad beds! Excellent tips to help me plan this year's garden! Thank you for sharing your post at the #HomeMattersParty - we hope you will link up with us again on Friday. I started gardening last year and was pretty impressed with our first go at it. Looking forward to getting started this year, too. Thanks for bringing your post to the Blogger's Pit Stop. Oh! We love to grow herbs and vegetables in the spring and summer. These are all fantastic tips. I can't tell you how many times we've come home after a vacation and been saddened to see that we lost most of our plants. Planning around the time you have available is probably one of the tips that people should use most, but is often overlooked. Thanks for sharing your tips with us about growing vegetables. Great to have you link up with us at #OvertheMoon Link Party. I've pinned and shared. These are some great things to think about when you are planning your garden! Thanks for sharing on Waste Less Wednesday Blog Hop! #3 was my downfall with last year's garden. I was heavily pregnant during the summer and I also have a 2 year old & a homeschooled 8 year old + livestock to care for. I tried to grow a large variety of veggies in my garden and it pretty much all died because I just didn't have time for anything except the super low maintenance plants (have you ever tried to kill okra??). Thanks for sharing this post on The Homestead Blog Hop! I have not tried to kill okra....but I dang near killed the cucumbers last year and they're pretty hardy! lol I did not have enough time in my garden last year sadly, so I'm hoping for a better growing season this year!